Yachting Developments is pleased to have welcomed the 80ft maxi yacht Lion New Zealand to the yard, where she will undergo a top to bottom refit. 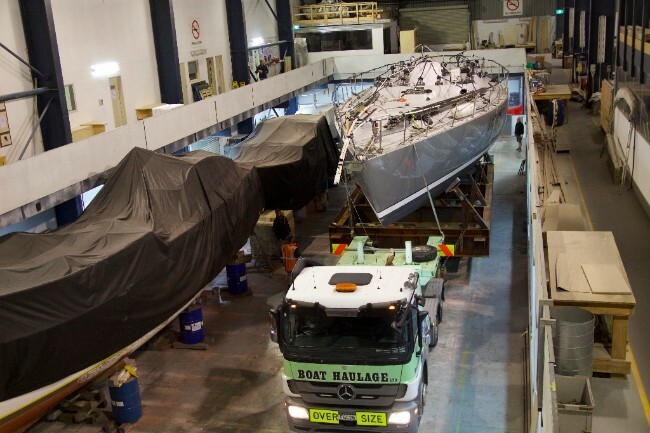 The yacht was hauled out of the water on 15 May 2017 before making her way to the yard’s Hobsonville facility in the early hours of the morning of 20 May, where she will complete her extensive overhaul. Now 32 years old this iconic yacht was built for Sir Peter Blake’s fourth attempt at the Whitbread Round The World Race in 1985/1986 and designed by renowned Kiwi yacht and superyacht designer Ron Holland. Currently owned by the NZ Sailing Trust, which purchased the yacht in 2008, Lion New Zealand plays an important role in fulfilling one of the Trust’s key goals of maintaining Blake’s legacy by providing youth sailing experiences to young New Zealanders. Having welcomed thousands on board and covered more than 200,000nm during her time with the Trust, Lion New Zealand is now in need of a much deserved restoration and refit in order to return her to peak condition and allow the Trust to continue their important work. This project is the perfect fit for the Yachting Developments, with the yard having previously undertaken a major refit on the Trust’s other major vessel, Steinlager 2. The refit also has personal significance for the yard, as Managing Director Ian Cook was part of the original build team for Lion New Zealand back in 1985. Lion New Zealand’s planned refit list is extensive and will include a new mast, boom and keel, new rigging, deck winches and electronics, a full paint job in the yacht’s original colours and new antifouling. The interior will also receive a refresh with new accommodation and a reconfigured galley and forward area, new electronic, lighting and navigation systems, and new plumbing. Engineering work will see new systems including a new propeller shaft, engine and propeller. All work will be sympathetically undertaken to maintain Lion New Zealand’s history and original design. Yachting Developments is an award-winning builder of composite yachts. The owners and staff at Yachting Developments have shared the vision and dreams of more than 70 individual clients, creating vessels of the highest quality standards, designed and custom made to the client’s brief. With launches including 33.83m Cygnus Montanus, 37m S/Y Bliss and 30.5m S/Y Quintessential, and the award-winning refit of the J-Class Endeavour to their name, the yard has forged a strong international reputation for its high quality work and specialist team. Operating out of a 10,000sqm yard facility that includes 5,000sqm of fully equipped sheds and water access in Auckland’s Hobsonville, Yachting Developments is able to service yachts of up to 60m. The yard welcomes all inquiries for new build, refit and service work, for both small and large projects, and can also service yachts on location.